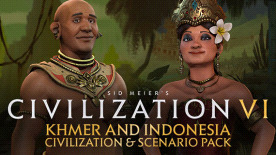 Jayavarman VII leads Khmer and Dyah Gitarja leads Indonesia in Sid Meier's Civilization VI! Though each is versatile and unique, both civilizations bring new challengers to the religious game. Indonesia is a strong coastal civilization with potential for a huge Jong-powered navy, and the Khmer thrive in their populous riverside cities. Both of these civilizations come into play in the new "Path to Nirvana" scenario, where you compete to have the most followers of your religion on a unique Southeast Asia map. Civ Unique Ability: The "Grand Barays" ability gives Khmer additional food when Farms are built next to Aqueducts, and Aqueducts provide both Faith and an Amenity. Leader Unique Ability: Jayavarman's "Monasteries of the King" ability lets Khmer grab adjacent territory as well as Food and Housing when Holy Sites are built on a river. Civ Unique Ability: With the "Great Nusantara" ability, Coastal Tiles provide Indonesia with minor adjacency bonuses for certain districts and Entertainment Complexes give an extra Amenity if they are adjacent to a non-lake Coastal Tile. Leader Unique Ability: Gitarja has the "Exalted Goddess of the Three Worlds" ability, granting bonus Faith to coastal cities and allowing her to purchase Naval units with Faith at a discount, as well as eliminating movement cost for Religious unit to embark or disembark. Unique Unit: Indonesia's unique unit is the Jong, which replaces the Frigate. It is faster, gains extra combat power if it's in a formation, and all of the units in its formation gain its movement speed. Angkor Wat: The largest religious monument in the world returns to Civilization! This temple must be built adjacent to an Aqueduct and provides Faith, plus it adds Housing and a Citizen to every one of the owner's cities when built. Please note: Requires Civilization VI (base game) to use this DLC. EULA: Use of this product requires agreement to the following third party end user license agreement here.